Last week I asked: What was the busiest airport in 1945? North Field on Tinian Island in the Northern Marianas. When John and I visited Tinian Island we rented a car and drove to North Field at the far end of the island. North Field is in the process of being reclaimed by nature with most of the field overgrown. 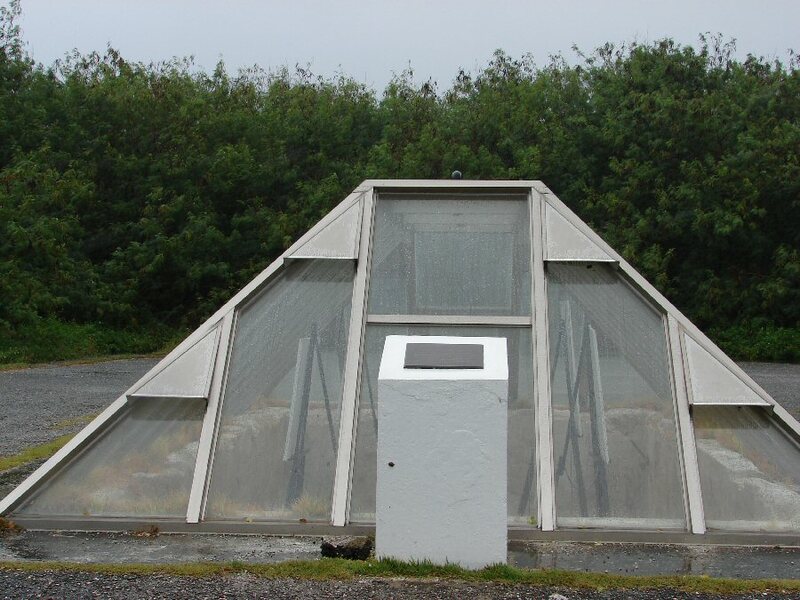 There are a few monuments commemorating units who served on the island, glass shelters over the two pits that once housed the atomic bombs, and some bomb shelters. 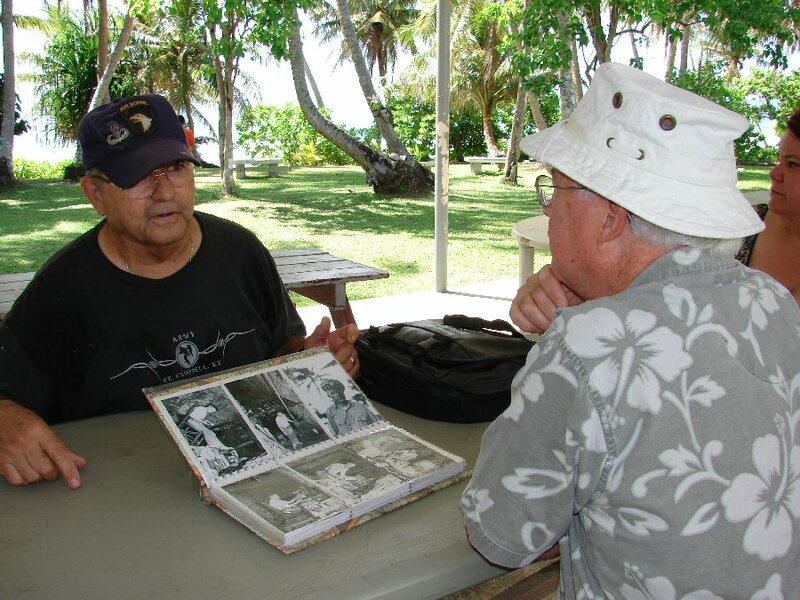 It was from Tinian that the atomic bombs were dropped on Hiroshima and Nagasaki. 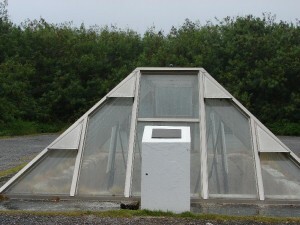 Considering the impact of the atomic bomb on history I had expected a better preserved site. For Americans World War II started in the Pacific on Dec. 7, 1941 and ended in the Pacific in 1945 yet it seems to me that much of the War in the Pacific has been overshadowed by the events in the European Theater. During the war in the Pacific, 112 thousand Americans were killed or missing, 253 thousand were wounded, and 22 thousand became prisoners of war. For the Japanese, 1.7 million were killed or missing, 94 thousand wounded, 41,000 became prisoners of war, and there were 400,000 civilian deaths. The figures are staggering and it doesn’t include the islanders who were killed. The numbers are staggering and each number represents a personal story. Each pacific island has its own story. The Japanese invasion of Guam resulted in 21 deaths, fourteen Americans and seven islanders. 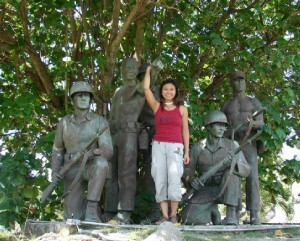 The island remained under Japanese control for 31 months until July 21, 1944. 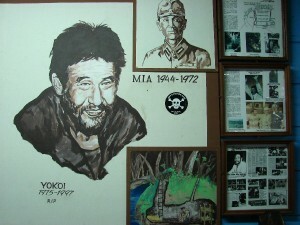 When I was in Guam I met Jackie, a friend of a friend on Guam. 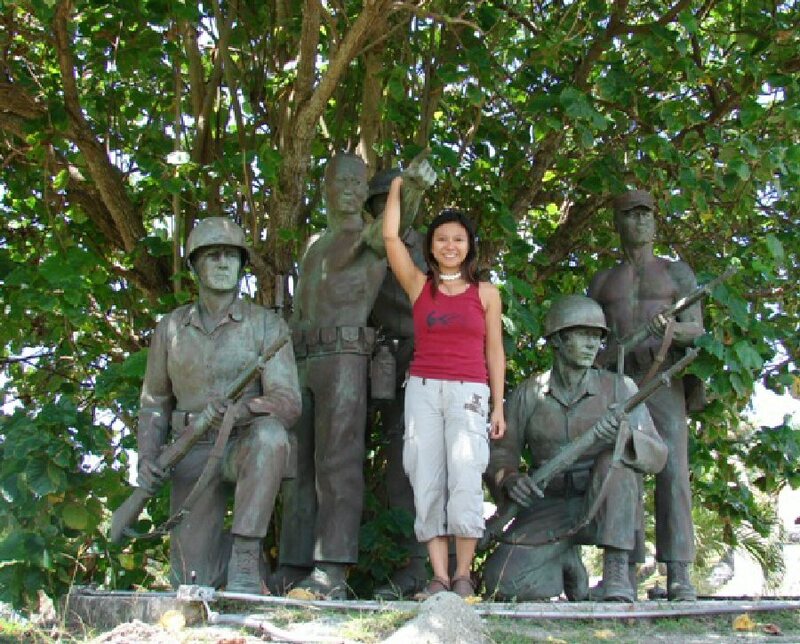 We stopped at a bronze World War II statue that included Jackie’s father, Francisco Jesus Cruz, who killed an enemy soldier and put on the dead Japanese soldier’s uniform making it possible for Cruz and his friends to gain entry to the Japanese camp and blow it up. One unforgettable day, John and I met Franklin Arturo who shared the story of George Tweed. Franklin Arturo shares the story of George Tweed. Tweed was the chief radioman when the Japanese invaded the island. He and five other men slipped into the jungle rather than become prisoners of war. All were captured and beheaded but Tweed. He hid out for two years and seven months during which time he was protected by the Arturo family. Franklin recalls accompanying his father to the cave where Tweed hid. When the Marines returned to Guam, Tweed signaled the American destroyers with flags he had made and a pocket mirror. He warned them about the Japanese gun placements and asked to be rescued. Within five minutes of receiving his message rescue was on the way. While Tweed was hiding on one end of the island at the other end some Japanese refused to surrender and hid out for years. During the last battle of Guam 1,747 Americans were killed, 6,053 were wounded and on the Japanese side 18,040 were killed and 485 taken prisoner. I think the personal stories are often lost in the numbers but everyone who was touched by World War II has a personal story. Travel Trivia Tease™: What was the name of the dog that traveled with Lewis and Clark. Look for the answer next week.